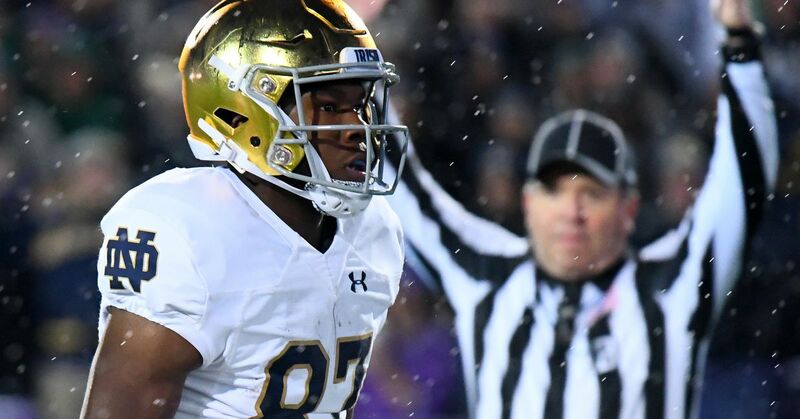 OFDer, Clearwall, makes another guest appearance to discuss a few of the calls from the officials during the game between the Notre Dame Fighting Irish and Northwestern Wildcats. The 24-hour Rule: You are required to wait 24 hours after a game before approaching the authority with any concerns, complaints, or suggestions. Doing this allows adrenaline and anger to subside and for cooler heads to prevail leading to a more purposeful and beneficial discussion on any issue. The quote above it taken directly from the operating policies for my son’s hockey team and I think it is a great idea for anyone involved in sports. For us fans, I think it can apply to commenting about things like officiating, coaching decisions, play calls and everything in this vein. Now, I’m not telling you to never comment on this site in the “Immediate Reaction” posts. Those are where we get all of our excitement, anger, adrenaline, and other fresh thoughts and feelings out of our system. But there comes a time where we need to have reasonable discussion about things and I feel like 24 hours is a good timeframe. It’s now been 136 hours(as of the time of this writing) that the Notre Dame Fighting Irish dispatched the Chicago Jr. High Wildcats so we’ve long past that threshold. However, I would like to take the time now to revisit a few situations from an officiating standpoint that I believe will help us learn and grow as intelligent fans. I’m not here to complain about holding calls not being made nor am I going to address 0 fouls to 8. My commentary on that has already been made and you know where I stand on that. Today, I want to take you into the world of football officiating training and introduce a tool that we have at our disposal to improve as officials. I’ve mentioned on this forum many times before about Dr. Rogers Redding. I have a deep affinity for him and massive respect for his career. To summarize, his most recent position was the Secretary Rules Editor of the NCAA and National Coordinator of Officials. He was replaced in 2016 as the Secretary Rules Editor (by former SEC referee Steve Shaw) but Dr. Redding still holds the title of National Coordinator. As such, he is the top official in the country similar to how the Attorney General of the United States is the “top cop.” In this role, he is responsible for training and evaluating officials in all conferences. Every week, Dr. Redding puts out a video review of around 15-25 plays that come in to the CFO office from around the country and he comments on certain plays that were either done correctly, incorrectly, or other situations that he feels could benefit all officials from learning through the mistakes or successes of others. Interestingly enough, this week, the ND/NW game was featured a few times in the video review. I have collected those plays and have linked them below. This was a play that I commented on immediately after the game that I thought was incorrect. I prefaced my belief by saying I had only seen the play once and it was on a cell phone and I was on the road at the time, so I couldn’t focus too carefully on it. It appeared to me that the contact was extremely light and I thought it was a too insignificant to warrant taking away the play. However, the next morning after I had seen the play on a full screen, I agreed with the call. Dr. Redding agreed. Here are his comments. I thought Bill Lemonnier did a very good job describing this play without directly impugning the officials who made the call. Listening to him describe it and knowing Bill like I do, I knew he was holding back his true thoughts out of courtesy to the crew. This is not a situation we want to be in as officials and as soon as we have conflicting signals, both guys are going to know instantly “this is not good.” Redding says it perfectly that “it causes confusion” and you can see that in Kelly’s body language as well as the comments by the TV crew. I don’t blame anyone for being upset how this went down. My .02 on how this SHOULD have gone: look at the 4th down stop against Stanford in 2012 and do exactly that. Both wing officials should crash in hard and only signal the clock to stop. Confer with each other about what you saw. Lemonnier said on the broadcast that (paraphrased) “if I know for sure that a guy went in the EZ, I have the right to overrule [my partner].” This is TRUE, but these guys never even got to that. The Head Linesman (on the top of the screen) basically imposes his call and takes his partner’s opinion completely out of it. He’s not OVERRULING the Line Judge, he’s forcing a ruling. Personally, I don’t think it should even be his call because there’s no way he can definitely see the ball. He couldn’t possibly because the line feed shows the ball from the LINE JUDGE view. The H only has a view of Thorson’s back which is covering up the ball. The L can see the ball and has made his ruling as he comes in. If they had done it how I suggest, they would have gotten together with the R, they would have each said what they saw, the R would say “did you see the ball?” The L would say “yes” which we know is true because we have the video proof of that. The H, if he were being honest would say “no.” The R, then would ask the L what his ruling is because he’s the one that sees the ball. After this, regardless of the ruling, replay would review it and determine whether or not the ball broke the plane. Play #3 – Why are we replaying this? Nothing really to comment here. Rogers tells you why he put it on the review. It didn’t help anything and nothing changed by replaying it. Likely neither coach would complain if the play was upheld or overturned so just let it go. That’s it. Now, the purpose of this video series is to train officials about how to do our jobs better. He’s not going to go through every game and every call and comment on them. So if there WAS a holding that was missed, and again after I re-watched the game I saw nothing either, Rogers is not going to bring all that up unless it’s a big issue. If you saw something in this game, or in future games if there is a call you have a question about, please feel free to tell me about it. Tell me the quarter, the time, and what happened and I can chime in on it. Until next time…get the big ones!